For years, yes years, my husband and I have belly-ached about the lack of breakfast places in Columbia. And, even more so, the lack of GOOD breakfast places in Columbia. Some have come. And gone. Then there are the old standards. Don't get me wrong, there is certainly a time and place for a midnight run to the Waffle House. I have fond memories of Simple Simon's in Spartanburg after a long night of Wofford parties. But now that I am a "mature" adult (yes, I use that term very loosely) I want a sit-down-enjoy-your-coffee-and-an-interesting-menu kind of place. Breakfast and lunch are what we do. family friendly is who we are. So, they opened last week. I made it over there one day for lunch with my mom and one of her friends. I was pretty hungry, so I didn't photograph anything. But I ordered the Tuscan BLT which was quite good. Nice grilled (non-grocery store) bread. It was NOT loaded with mayo, which is a good thing, in my book. Today, I had the rare occasion to go out to breakfast with my husband. He was really excited about getting to try out the new breakfast place especially after I told him about all the corned beef hash dishes on the menu! So he ordered the corned beef hash benedict. 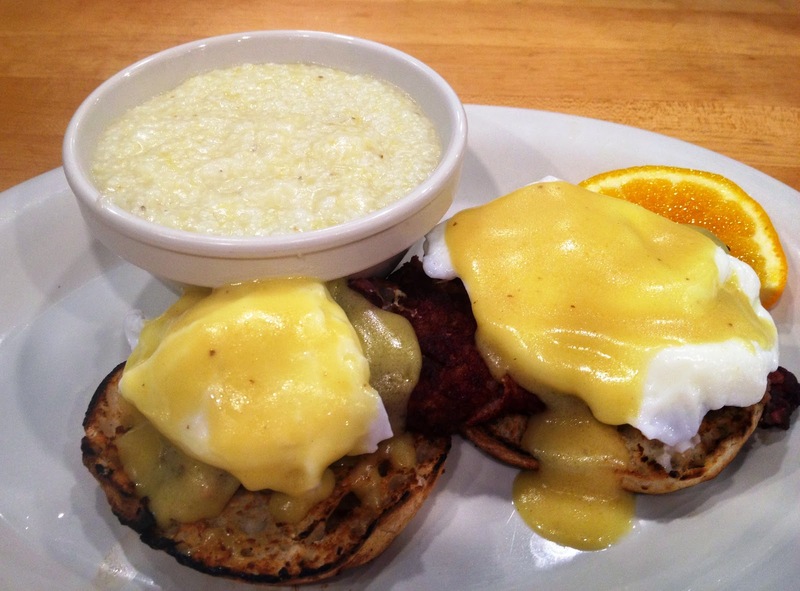 It consists of corned beef hash atop English muffins, perfectly poached eggs and Hollandaise. I'm still adjusting myself to poached eggs and these were really just right. The Hollandaise was flavorful yet light. I'm ordering this next time we go. If you don't like corned beef hash, you just ain't right! 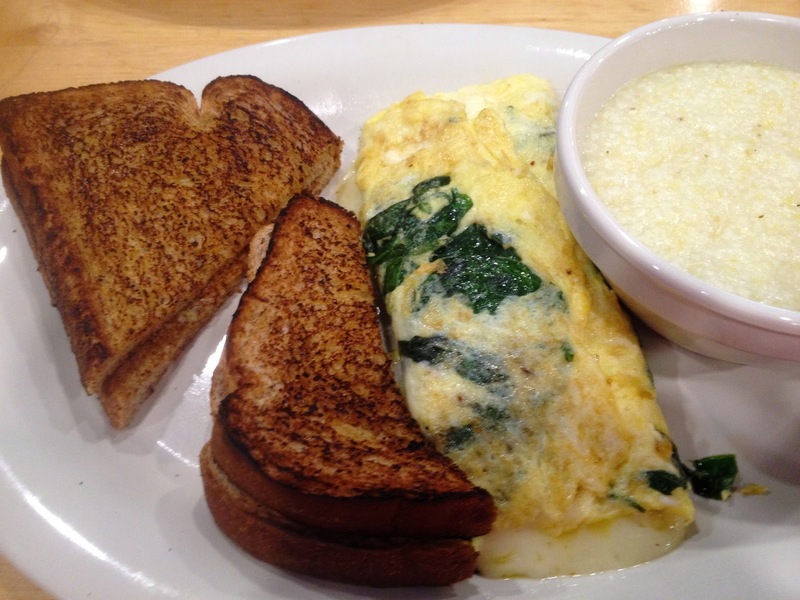 I chose the "build your own" omelet: my design was spinach and Swiss. This may sound rather boring, but I have to tell you, it was just delicious. The cheese was real. Y'all know how I am about fake cheese. The spinach was fresh. This is huge. Spinach does not belong in a can and if you serve it to me watch your head because the dishes will fly! My omelet was perfectly cooked and came with grits, again very nicely seasoned and well cooked (no lumps at all) and wheat toast. I could only eat half of it, so Neil has a midnight snack waiting in the wings. If you are like us and have been jonesin' for a good breakfast place, rejoice in the fact that we now have one. The interior doesn't look like a diner or a greasy spoon...it's an attractive restaurant. The servers are all friendly (like neighborhood friendly) and the food is fresh and well prepared. Totally kid friendly and with the large patio, you can meet up with a big ol' group of friends. Check out the menu because it's a good lunch spot as well. I hope Columbia will support Eggs Up and it will be our neighborhood breakfast go-to for many, many years. P.S. My friend Stephanie is a super mom who is working here now. Works out well to be available when her 3 kids get out of school. (There are 2 Stephanies so ask for "Stephie".) I can also vouch for Liz & Jay as excellent servers, so you really can't go wrong in the service department with this place! As a junior in college, I "set sail" for a semester living with a family in France. I was attending the Universite de Haute Bretagne in Rennes. This is located in NW France. It's rainy, gray and drab. Why did I choose to go here? A husband & wife professor team from Wofford had just returned from a stint there and they raved about it. I won't elaborate but suffice it to say that their impressions were vastly different than my own. But, hey! I was in France! I lived with a family (Yves, Nicole & their daughter Christelle) outside of Rennes. A little village called Mordelles, to be exact. There was another American (Pam from Michigan) about 3 doors down at the home of some friends of my family. It was great having her there. We rode in on the bus together and had most of the same classes. We became good friends which was good for our mutual mental health since we were living with some slightly crazy people. But aside from the meat-eating bird in the kitchen, the fact that it took 3 weeks for my cotton sweater to dry because I wasn't allowed to use the dryer, and the fact that they left me alone for Christmas, the parties were great and hey, I was in France! All kidding aside, though, living in a little village had some charms. For instance, they still had the specialty shops...the charcuterie, the patisserie, and the boulangerie (the bread bakery). Every other morning, before the rest of us were up, Yves would walk to the boulangerie and bring back a loaf of fresh "pain de campagne." Country bread. This stuff was just heavenly. It was a round loaf and he would always have the boulanger slice it. It was kind of chewy and stood up well to rich butter, jams or even as a sandwich. (I almost gave Yves a heart attack when he found me loading up pain de campagne with ham & cheese for a picnic.) He got over it but I hope he learned from me that this stuff is great sandwich bread! Anyway, this all took place back in 1988. Yes, way back in the mythical 80's. Since then, I've often thought of that bread. I miss it. A simple breakfast of strong coffee, country bread and butter can't be beat. But alas, back here across the pond, I've never found any country bread. Until now. I found it. 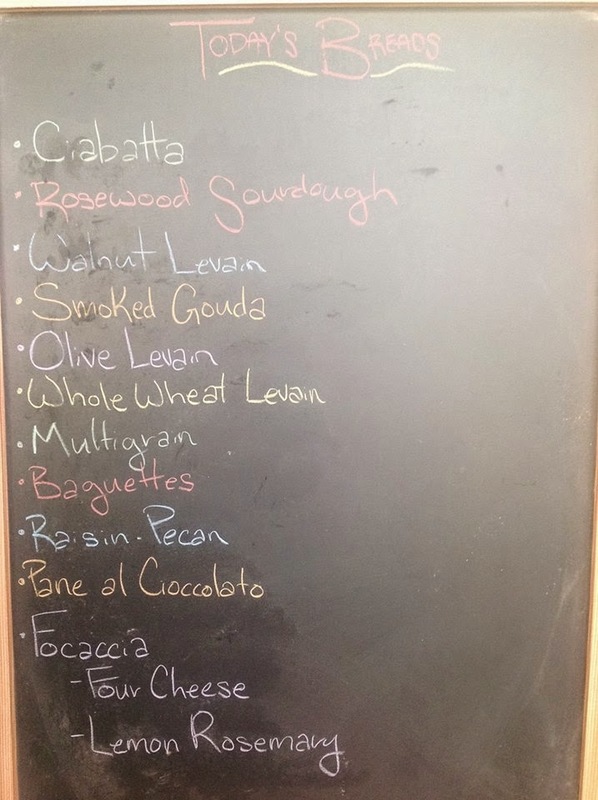 I have neighbors who own Rosewood's Crust Bakehouse over near Rockaway's. I wandered in recently just to see what they had that day. I really love their semolina bread...also great sandwich bread. As we checked out the daily offerings, I glanced over at the "day old" rack and there it was! Pain de campagne! Right there on that rack, right here in my neighborhood! I couldn't believe my eyes. Without one iota of hesitation, I was paying the lady. 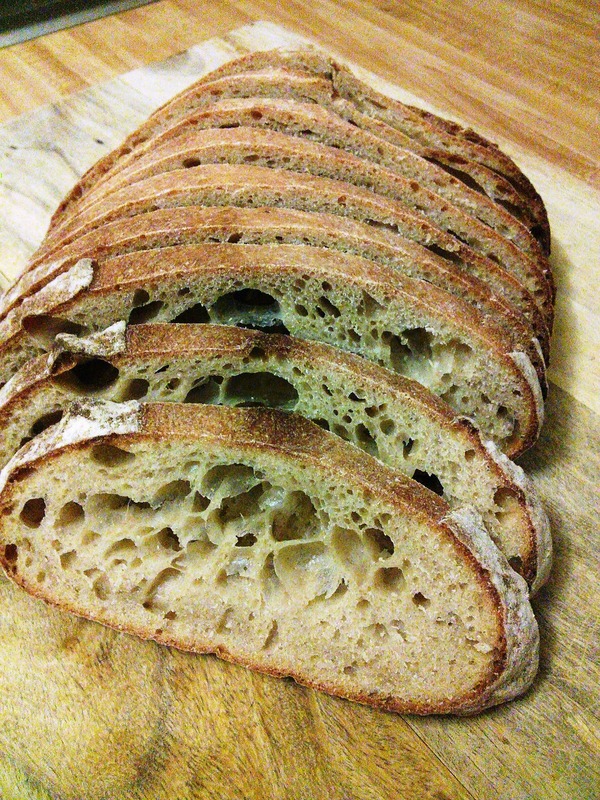 I couldn't wait to get it home and see if it could possibly be anything like the pain de campagne from Mordelles. To my delight, it was exactly as I remembered it! It was 1988 again and I had my own loaf of happiness. I can't even begin to tell you how excited I was to know that someone else knows about this simple, peasant bread and is making it right here in my neck of the woods. OMG, I may have to get a loaf as soon as they open tomorrow! If you haven't visited Crust, you need to make a point of going by. They are real people, not a chain. They bake different breads du jour so you can follow them on Facebook to see what the daily choices are. I can't wait to try the bread with smoked gouda in it!